The commonest form of ASD is the secundum type, which accounts for 80% of cases. A secundum ASD is located in the region of the fossa ovalis. 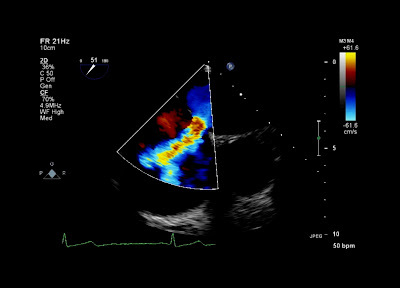 Primum ASD accounts for 15% of cases, and is located near the crux of the heart, often involving the mitral and/or tricuspid valves. Primum ASD is the most common congential heart defect seen in patients with Down syndrome. Other types of ASD include superior sinus venosus defect, inferior sinus venosus defect, and unroofed coronary sinus. An ASD most commonly causes left-to-right atrial shunting and consequent volume overload of the right heart. ASD is commonly asymptomatic until adulthood. Clinical examination findings in ASD include fixed splitting of the second heart sound, and a pulmonary flow murmur in systole. ASDs can be closed percutaneously or by surgical repair. For secundum ASDs, percutaneous device closure is the preferred method of closure, and is technically feasible in around 80% of cases. The development of pulmonary hypertension due to pulmonary overcirculation can, eventually, lead to reversal of the interatrial shunt to right-to-left, and therefore cause cyanosis. This is known as Eisenmenger physiology, and is relatively rare (<5% of cases). ASD closure should be avoided if a patient has developed Eisenmenger pathology.